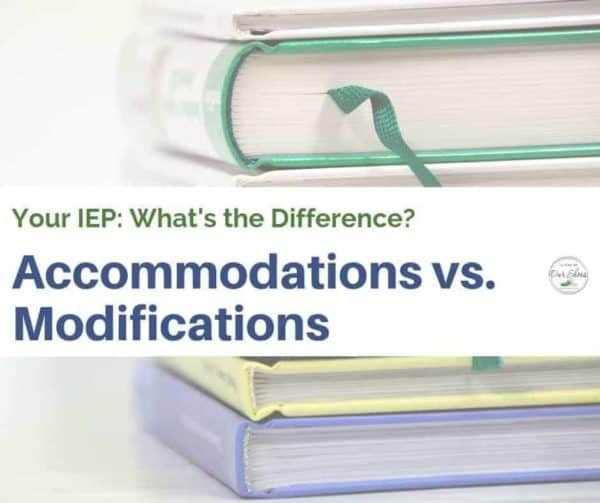 What's the Difference between IEP Accommodations and Modifications? Home » IEP Goals, Accommodations and Strategies » What’s the Difference between IEP Accommodations and Modifications? All three of the above items are a part of the meat and potatoes portion of the IEP. It’s a huge concern for parents. I know this because it’s often one of the first sections you turn to when you are handed a new draft IEP. On most IEPs, you will find this section after the IEP goals section. On my document, it is listed as: SPECIAL EDUCATION / RELATED SERVICES / SUPPLEMENTARY AIDS AND SERVICES / PROGRAM MODIFICATIONS. 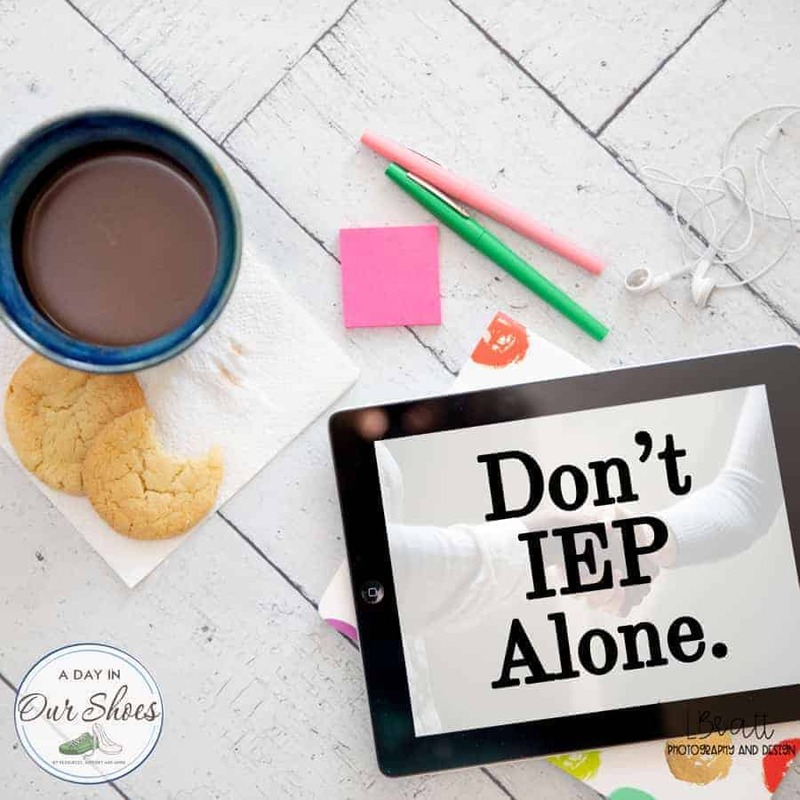 This month, I will have several more blog posts and IEP podcasts coming out explaining the various sections of the IEP. What are supplementary aids and Services on the IEP? From IDEA: Supplementary aids and services means aids, services, and other supports that are provided in regular education classes, other education-related settings, and in extracurricular and nonacademic settings, to enable children with disabilities to be educated with non-disabled children to the maximum extent appropriate in accordance with §§300.114 through 300.116. Supplementary aids and services means aids, services and other supports to enable students with disabilities to be educated with non-disabled students to the maximum extent appropriate in the least restrictive environment. Examples include a note taker; assignment of paraprofessional staff (or a one-to-one teacher aide or assistant) or study guide outlines of key concepts. Program modifications may be used to describe a change in the curriculum or measurement of learning, for example, when a student with a disability is unable to comprehend all of the content an instructor is teaching. Examples include reduced number of assignments or alternate grading system. If you think that your child needs modifications, you should take your time and research it properly. Modifying curriculum may put your child on an alternate diploma track. You should ask all of these questions during IEP meetings. Or, have a separate meeting with just an administrator (likely someone who handles curriculum or pupil services) to explain what your state requires for diplomas and what alternates are available. Obviously the decision whether or not to pursue a high school diploma is a serious one. You should also read your state’s Dept of Ed website regarding this. Alternately, you could possibly choose a modified curriculum and your school district just “passes him through” and gives your child a diploma. Then, they could find themselves in college or vocational training and be unprepared. IEP Accommodations are adjustments to the environment, instruction or materials that allow a student with a disability to access the content or complete assigned tasks. Accommodations do not alter what is being taught. Examples include instructional materials in alternative format such as large print or Braille, fewer items on each page or extra time to complete tasks. Hopefully after reading this paragraph and the one above it, it makes more sense. You can also use that link to find literally thousands of accommodation ideas for IEPs. I have it broken down into areas of need, such as anxiety, executive functioning, ADHD, working memory and so on. Making the Decision-IEP or 504? Once you understand the differences between these three things, you can better decide if your child needs an IEP or a 504. If your child only needs accommodations, then a 504 is likely appropriate. However, as an advocate I am finding that 504s are being overused when an IEP is warranted. And the school talks the parent into “trying a 504” instead of evaluating the child. A year or two or more of just accommodations, and without the other services and modifications, the child has fallen further behind. I’ve also heard some odd secondhand information from parents that 504 Accommodations cannot be put on an IEP. They can. I’m not sure why anyone would want to have to monitor two separate documents. Except for the fact that 504s do not carry procedural safeguards, thus parents have fewer options if they are not followed. Ok, there you go. IEP Modifications, Accommodations and Supplementary Aids and Services. Hopefully you have a better understanding. « What parents should understand about FAPE and how the Supreme Court affects our kids.